Objective: To quantify the antiemetic efficacy and adverse effects of cannabis used for sickness induced by chemotherapy. Data sources: Systematic search (Medline, Embase, Cochrane library, bibliographies), any language, to August 2000. Studies: 30 randomised comparisons of cannabis with placebo or antiemetics from which dichotomous data on efficacy and harm were available (1366 patients). Oral nabilone, oral dronabinol (tetrahydrocannabinol), and intramuscular levonantradol were tested. No cannabis was smoked. Follow up lasted 24 hours. Results: Cannabinoids were more effective antiemetics than prochlorperazine, metoclopramide, chlorpromazine, thiethylperazine, haloperidol, domperidone, or alizapride: relative risk 1.38 (95% confidence interval 1.18 to 1.62), number needed to treat 6 for complete control of nausea; 1.28 (1.08 to 1.51), NNT 8 for complete control of vomiting. Cannabinoids were not more effective in patients receiving very low or very high emetogenic chemotherapy. In crossover trials, patients preferred cannabinoids for future chemotherapy cycles: 2.39 (2.05 to 2.78), NNT 3. Some potentially beneficial side effects occurred more often with cannabinoids: “high” 10.6 (6.86 to 16.5), NNT 3; sedation or drowsiness 1.66 (1.46 to 1.89), NNT 5; euphoria 12.5 (3.00 to 52.1), NNT 7. Harmful side effects also occurred more often with cannabinoids: dizziness 2.97 (2.31 to 3.83), NNT 3; dysphoria or depression 8.06 (3.38 to 19.2), NNT 8; hallucinations 6.10 (2.41 to 15.4), NNT 17; paranoia 8.58 (6.38 to 11.5), NNT 20; and arterial hypotension 2.23 (1.75 to 2.83), NNT 7. Patients given cannabinoids were more likely to withdraw due to side effects 4.67 (3.07 to 7.09), NNT 11. Conclusions: In selected patients, the cannabinoids tested in these trials may be useful as mood enhancing adjuvants for controlling chemotherapy related sickness. Potentially serious adverse effects, even when taken short term orally or intramuscularly, are likely to limit their widespread use. Sections of the medical establishment have pleaded for legalisation of cannabis (marijuana) for medical use. 1 2 Interest in cannabis and its active constituents, cannabinoids, as therapeutic agents has increased recently.3 Dronabinol (Δ9-tetrahydrocannabinol, one of the main ingredients in cannabis) and the synthetic cannabinoid compound nabilone are available by prescription in some countries. We searched systematically for the strongest evidence of efficacy and harm of cannabis in patients having chemotherapy. We examined whether there is any evidence that cannabis is antiemetic when given concomitantly with emetogenic chemotherapy, how well cannabis works in this setting compared with placebo or conventional antiemetics, the evidence for a dose-response relation, and the profile of adverse effects. We searched systematically for randomised controlled comparisons of the antiemetic efficacy of cannabis (experimental intervention) with any antiemetic or placebo (control) in chemotherapy. Two authors (DC and MRT) searched independently, using different search strategies, in Medline and Embase (last search, 10 August 2000). Free text key words used were cannabinoids, cannabis, nabilone, tetrahydrocannabinol, THC, marihuana, marijuana, levonantradol, dronabinol, randomised, randomized, and human. We also searched the Cochrane Library (issue 3, 2000). Reference lists of retrieved reports and review articles were checked. The search included data in any language. Only full publications in peer reviewed journals were considered. Data from abstracts, letters, and reports from other clinical settings (radiotherapy and postoperative nausea and vomiting) were not considered. We did not contact authors or manufacturers. All retrieved reports were checked for inclusion criteria by one author (MRT). Those definitely not relevant were excluded at this stage. All potentially relevant reports were then read by all authors independently to assess adequacy of randomisation and blinding and description of withdrawals according to the validated three item, five point Oxford score.8 The maximum score of an included randomised controlled trial was five and the minimum was one. Authors met to reach a consensus. From relevant reports we obtained information on patients, dose of cannabis and control treatments, chemotherapy regimens, and relevant end points. The end point of primary interest was antiemetic efficacy. Different end points for antiemetic efficacy were reported. A “major response,” for instance, could be “no more than two vomiting episodes” in one trial. A “partial response” could be defined as “a reduction of 50% or more in the duration or severity of nausea, and in the number of vomiting episodes, compared with previous courses of identical chemotherapy” in another trial. Because of this inconsistency in definitions we extracted only dichotomous data that came closest to complete control (that is, absence) of nausea or vomiting in the first 24 hours of chemotherapy. Some studies reported incidence of nausea or vomiting per “treatment episode” or per “treatment cycle” rather than per patient. These data were not further analysed. The end point of secondary interest was the number of patients who, after completion of the trial, expressed preference for cannabis or control for future chemotherapy cycles. Data on adverse effects were extracted when reported in dichotomous form. We looked for a dose-response relation in data from clinically homogeneous subgroups. 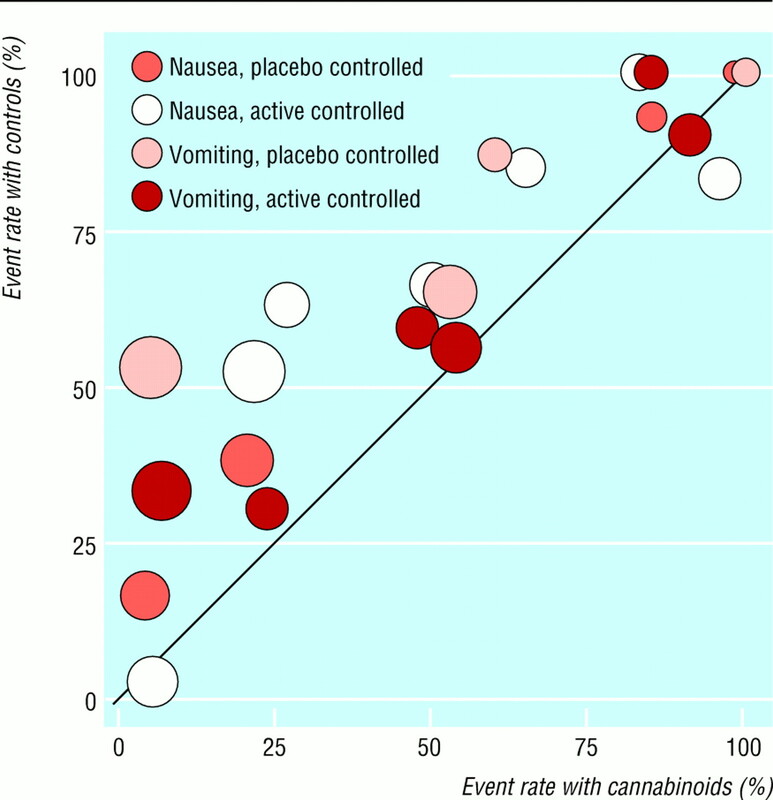 Such subgroups had to report comparisons of different doses of one cannabinoid (for instance, nabilone) with one comparator (for instance, placebo), have a similar underlying emetogenic risk (for instance, highly emetogenic chemotherapy with cisplatin), and have a well defined end point (for instance, complete control of vomiting). We analysed data from 30 randomised controlled trials published between 1975 and 1997 (table 1). In the 30 trials, 1760 patients were randomised, but subsequently 394 (22%) were excluded by the original trialists. Thus, efficacy data from 1366 patients could be analysed. The average trial size was 46 patients (range 8 to 139). The median quality score was 4 (range 1 to 4); 17 scored 4, eight 3, two 2, and three 1. The method of blinding was adequate in 21 (70%) trials—for example, identical tablets. Twenty five trials (83%) used a crossover design. Since the results from crossover trials were usually reported as if they had come from a parallel group trial we used the data accordingly. The median number of chemotherapy cycles was two (range one to six). Two trials were in children, 34 39 and one in both children and adults.58 All other trials were in adults only. Various tumours were treated. Chemotherapy was with a variety of cytotoxic regimens with different emetogenic potencies (table 1). Five trials reported on the number of patients with a history of cannabis use. 35 36 58-60 In nine trials, all patients were reported not to have used cannabis previously. 33 34 39 41-43 46 49 51 In the other 16 trials, it was unclear whether patients had used cannabis previously. Commonest controls were prochlorperazine (12 trials), and placebo (10 trials). Other comparators were metoclopramide (four), chlorpromazine (two), thiethylperazine (one), haloperidol (one), domperidone (two), and alizapride (one). 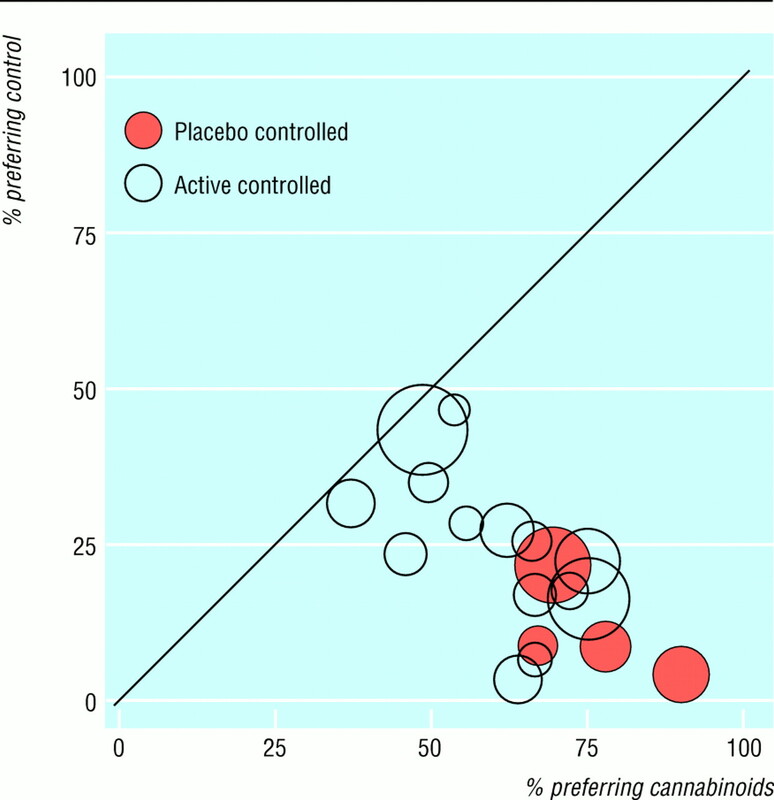 Across all trials, cannabinoids were more effective than active comparators and placebo (table 2). Six to eight patients needed to be treated with cannabinoids for one to benefit who would have vomited or had nausea had they all received a conventional antiemetic. One trial reported very low event rates in the control groups: 16% of patients felt nauseous with placebo and 2% with prochlorperazine.41 Chemotherapy was mainly with low emetogenic substances (vincristine, fluorouracil) (table 1). When data from active controlled trials with medium control event rates (25% to 75%) were combined, cannabinoids were superior to conventional antiemetics, and numbers needed to treat were below 4 to prevent nausea and below 7 to prevent vomiting (table 2). When data from active controlled trials with extreme event rates in control groups (<25% and >75%) were combined, there were no significant differences between cannabinoids and active comparators (table 2). It became clear that cannabinoids were antiemetic only when the components of the chemotherapy regimen and the event rates in control patients suggested a medium emetogenic setting. We therefore tried to test for dose responsiveness after excluding trials that reported extreme event rates in control groups. The largest clinically homogeneous subgroup contained just two trials, which compared dronabinol 30 mg per day with prochlorperazine 20 mg41 and dronabinol 28 mg/m2 with prochlorperazine 30 mg/m2.55 No sensible conclusion on dose-response relations with cannabinoids could be drawn. For the same reason, no conclusion could be drawn on the relative efficacy of nabilone, dronabinol, or levonantradol. At the end of 18 crossover trials, patients were asked which treatment they preferred for further chemotherapy cycles. Between 38% and 90% of patients preferred cannabinoids (fig 2). In four placebo controlled crossover trials preference for placebo was between 4% and 22%. 28 47 50 61 The difference in favour of cannabinoids was significant (table 2). In 14 active controlled crossover trials 3% to 46% of patients preferred the standard antiemetic. 32-34 38-40 42 44 46 51-54 59 The difference in favour of cannabinoids was significant (table 2). A subgroup analysis, taking into account history of cannabis use, was not possible since this was inconsistently reported. In the only parallel group trial that reported preference as an end point,45 78% of the patients who had received chlorpromazine and 58% of those who had received levonantradol wished to receive the same drug for future chemotherapy cycles. This difference that was not significant (relative risk 0.74, 95% confidence interval 0.50 to 1.09). Side effects happened significantly more often with cannabinoids (table 3). Some side effects could be classified as potentially beneficial (for instance, a sensation of a “high,” euphoria, and drowsiness, sedation, or somnolence) whereas others were definitely harmful (for instance, dysphoria and depression, hallucinations, or paranoia). Hallucinations and paranoia occurred exclusively with cannabinoids. Arterial hypotension (>20% decrease in blood pressure compared with baseline) was also more common with cannabinoids (table 3). In 19 trials, the number of patients who withdrew from the study due to intolerable adverse effects was significantly increased with cannabinoids (table 3). The evidence we have from randomised trials shows cannabinoids to be slightly better than conventional antiemetics for treating chemotherapy induced emesis, and patients prefer them. They are also more toxic. Two extreme positions could be taken, perhaps using the following arguments. The optimistic position favours cannabinoids. Overwhelmingly, patients preferred cannabinoids for future chemotherapy, even though cannabinoids were only slightly more effective than other antiemetics and only for moderately emetogenic chemotherapy. Patients' subjective view on preference is more important than the scientifically evaluated efficacy of that intervention. Although side effects occur more often with cannabinoids, these may be concentrated in a fairly small number of patients so that most patients find cannabinoids effective without undue adverse effects. There are even some potentially beneficial side effects. Of 100 cancer patients undergoing chemotherapy who received a cannabinoid 30 more would be sedated, 20 would feel a sensation of a “high,” and 15 would feel euphoric compared with 100 who received a conventional antiemetic. Some patients may perceive a degree of sedation or somnolence as useful during chemotherapy. Thus, further clinical trials with cannabinoids in chemotherapy are justified. The pessimistic position favours conventional antiemetics, as cannabinoids are not much better, and their toxicity is unacceptably high (dizziness, dysphoria, hallucinations, paranoia). The toxic effects may lead to study withdrawal. There were no comparisons of cannabinoids with a serotonin (5-HT3) receptor antagonist, the best comparator for prevention of acute emesis in highly emetogenic chemotherapy. It is, however, unlikely that cannabinoids would be more effective and less toxic than a 5-HT3 receptor antagonist. The correct position is probably somewhere in the middle. Undoubtedly, most patients preferred cannabinoids for future chemotherapy cycles. One in two compared with placebo, and one in three compared with conventional antiemetics would have preferred to receive cannabinoids again. We do not know whether the incidence of cannabinoid related “beneficial” side effects was related to this overwhelming preference for cannabinoids for future chemotherapy. Defining an intervention's usefulness includes estimates of the likelihood for harm. The physical and neuropsychiatric adverse effects of long term use of cannabis are well established, based mainly on observations from long term marijuana smokers.62 Our systematic review shows clearly that cannabinoids are toxic for many patients even when taken orally and acutely (for 24 hours). Some adverse effects occurred almost exclusively with cannabinoid exposure. For instance, 5% of patients had paranoia, 6% had hallucinations, and almost 13% had dysphoria or depression (table 3). The number of patients withdrawing from the studies due to intolerable side effects is the most reliable parameter of the severity of cannabinoid related toxicity. One in eleven patients treated with cannabinoids will stop treatment who would not have stopped treatment had they taken a placebo or another antiemetic. This is an important new message for doctors, policy makers, and patients. These results should make us think hard about the ethics of clinical trials of cannabinoids when safe and effective alternatives are known to exist and when efficacy of cannabinoids is known to be marginal. The trials analysed here are likely to be the largest subgroup on the medical use of cannabinoids and therefore the single most important source of information on their potential for harm. This meta-analysis is open to some biases, and they all have the potential to overestimate the efficacy and to underestimate the harm of cannabinoids. The trials we included were of acceptable quality according to the Oxford quality scale, with 25 of 30 trials scoring 3 or 4. In 70% of trials an adequate method of blinding was described. Most crossover trials used a double dummy design. Cannabinoids were given as tablets or intramuscular injection, so any psychological effect of smoking a joint was not a factor. However, cannabinoids showed specific adverse effects that control treatments did not, and their incidence was high. In one trial of oral nabilone, many patients identified which drug they received because of the adverse effects experienced.59 In a series of 100 blinded dronabinol and placebo treatments, nurses correctly identified the active treatment in 85% and patients in 95%; seven of the 10 errors were made by patients on the first drug trial of the study.63 We must therefore assume that most of these trials had some degree of observer bias. Some trials studied selected groups of patients who either had not responded to conventional antiemetic prophylaxis during previous chemotherapy cycles (“high risk” patients) or regularly used cannabis. Both subgroups introduce a bias in favour of cannabinoids. The selection of refractory patients introduces bias against the regimens that do not include cannabinoids.4 Younger age and previous marijuana exposure have been identified as factors that predicted response to antiemetic treatment.64 Regular cannabis users may be more likely to believe in its antiemetic efficacy. They may also experience adverse effects of cannabis more positively than patients who have not previously taken cannabis (for instance, a “high” or somnolence). In one trial, where more than 50% of patients were regular cannabis users, only 6% did not believe that cannabis would reduce their nausea and vomiting symptoms.60 In view of the numerous biases in these trials, “preference” and “satisfaction” are likely to be surrogate end points. These endpoints alone do not allow to judge with confidence on the usefulness of cannabinoids in the control of chemotherapy related emesis. Finally, we have the problem of size. Small trials can be greatly affected by the random play of chance.65 Of the 30 studies available for analysis, only nine had over 50 analysable patients and only four more than 100. Small size has been shown to overestimate treatment effects in other circumstances,66 and it is not possible to rule out similar effects here. The research agenda needs to be clear. Priority should go to trials of cannabinoids for indications where there are few competing drugs, such as spasticity in multiple sclerosis. In chemotherapy, the combination of weak antiemetic efficacy with potentially beneficial side effects (sedation, euphoria) raises the question whether further trials should be designed to establish the usefulness of cannabinoids as adjuncts to modern antiemetics (for instance, 5-HT3 receptor antagonists). Minimal effective doses would then be needed. Identification of patients who are most likely to profit from the antiemetic effect of cannabinoids and least likely to suffer from neuropsychiatric adverse effects is needed. In conclusion, the cannabinoids reviewed here were slightly superior to conventional antiemetics after chemotherapy, and patients preferred them. However, potentially serious adverse effects, even when the drugs are taken short term orally or intramuscularly, are likely to limit their widespread use. In selected patients, cannabinoids may be useful as mood enhancing adjuvants for the control of chemotherapy related sickness. We thank Daniel Haake from the Documentation Service of the Swiss Academy of Medical Sciences for his help in searching electronic databases. Contributors: MRT initiated the project, searched, extracted, and analysed the data and is the study guarantor. DC initiated the project, searched and cross checked extracted data. DJMR, FAC, RAM, and HJM cross checked extracted data. RAM and HJM provided the Excel template for data analyses. All authors participated in discussing the results and in writing the paper. Funding MRT received a PROSPER grant (No 32-51939.97) from the Swiss National Science Foundation. DC was supported by the Royal College of Nursing Institute RAE Grant. .Federal foolishness and marijuana (editorial).N Engl J Med1997;336: 366. .Marihuana as medicine: a plea for reconsideration.JAMA1995;273:1875–1876. .The cannabis remedy—wonder worker or evil weed?Lancet1997;350: 1828. .Medicinal applications of delta-9-tetrahydrocannabinol and marijuana.Ann Intern Med1997;126:791–798. .Marijuana as antiemetic medicine: a survey of oncologists' experiences and attitudes.J Clin Oncol1991;9:1314–1319. .Marijuana as an antiemetic drug: How useful is it today? Opinions from clinical oncologists.J Addict Dis1994;13:53–65. .Assessing the quality of reports of randomized clinical trials: is blinding necessary?Control Clin Trials1996;17:1–12. .Calculating confidence intervals for relative risk, odds ratios, and standardised ratios and rates. In: Gardner MJ, Altman DG eds.Statistics with confidence: confidence intervals and statistical guidelines.London: BMJ Books,1995:50–63. .An evaluation of homogeneity tests in meta-analysis in pain using simulations of individual patient data.Pain2000;85:415–424. .The number needed to treat: a clinically useful measure of treatment effect.BMJ1995;310:452–454. .Confidence intervals for the number needed to treat.BMJ1998;317:1309–1312. .Levonantradol bei der Behandlung von zytostatika-bedingter Übelkeit und Erbrechen.Dtsch med Wschr1982;107:1232–1234. .Antiemetic efficacy of nabilone and dexamethasone: a randomized study of patients with lung cancer receiving chemotherapy.Am J Clin Oncol1987;10:325–329. .The controlled substances therapeutic research act in the state of Washington.J Clin Pharmacol 1981; 8–9(suppl): 133–40S. .Antiemetic efficacy of levonantradol compared to delta-9-tetrahydrocannabinol for chemotherapy-induced nausea and vomiting.Cancer Treat Rep1985;69:109–112. .Nabilone and prochlorperazine: a useful combination for emesis induced by cytotoxic drugs.BMJ1985;291:864–865. .A randomized trial of oral nabilone and prochlorperazine compared to intravenous metoclopramide and dexamethasone in the treatment of nausea and vomiting induced by chemotherapy regimens containing cisplatin or cisplatin analogues.Eur J Cancer Clin Oncol1988;24:685–689. .Randomized, double-blind comparison of a prochlorperazine-based versus a metoclopramide-based antiemetic regimen in patients undergoing autologous bone marrow transplantation.Cancer1995;76:2330–2337. .A double-blind randomised cross-over comparison of nabilone and metoclopramide in the control of radiation-induced nausea.Clin Radiol1987;38:543–544. .Randomised clinical trial of levonantradol and chlorpromazine in the prevention of radiotherapy-induced vomiting.Clin Radiol1982;33:621–622. .Effect of nabilone on nausea and vomiting after total abdominal hysterectomy.Br J Anaesth1994;73:244–246. .Dronabinol as a treatment for anorexia associated with weight loss in patients with AIDS.J Pain Symptom Manag1995;10:89–97. .Amelioration of cancer chemotherapy induced nausea and vomiting by delta-9-tetrahydrocannabinol.Med J Aus1979;2:657–659. .Two-pronged study of tetrahydrocannabinol (THC) prevention of vomiting from cancer chemotherapy.IRCS Med Sci1980;8:203–204. .Dose ranging evaluation of the antiemetic efficacy and toxicity of intramuscular levonantradol in cancer subjects with chemotherapy-induced emesis.J Clin Pharmacol1984;24:480–485. .Physiologic observations in a controlled clinical trial of the antiemetic effectiveness of 5, 10, and 15 mg of delta 9-tetrahydrocannabinol in cancer chemotherapy. Ophthalmologic implications.J Clin Pharmacol1981;21: 103–19S. .Nabilone: an effective antiemetic agent in patients receiving cancer chemotherapy.Cancer Treat Rev1982;9(suppl B):55–61. .Dronabinol and prochlorperazine alone and in combination as antiemetic agents for cancer chemotherapy.Am J Clin Oncol1990;13:480–484. .Antiemetic effect of delta 9-tetrahydrocannabinol in chemotherapy-associated nausea and emesis as compared to placebo and compazine.J Clin Pharmacol1981;21: 76–80S. .THC or compazine for the cancer chemotherapy patient—the UCLA study. Part II: patient drug preference.Am J Clin Oncol1985;8:142–147. .Anti-emetic efficacy and toxicity of nabilone, a synthetic cannabinoid, in lung cancer chemotherapy.Br J Cancer1983;48:657–663. .Nabilone versus prochlorperazine for control of cancer chemotherapy-induced emesis in children: a double-blind, crossover trial.Pediatrics1987;79:946–952. .Delta-9-tetrahydrocannabinol as an antiemetic in cancer patients receiving high-dose methotrexate. A prospective, randomized evaluation.Ann Intern Med1979;91:819–824. .A prospective evaluation of delta-9-tetrahydrocannabinol as an antiemetic in patients receiving adriamycin and cytoxan chemotherapy.Cancer1981;47:1746–1751. .The antiemetic activity of tetrahydrocannabinol versus metoclopramide and thiethylperazine in patients undergoing cancer chemotherapy.N Z Med J1980;91:449–451. .Nabilone and metoclopramide in the treatment of nausea and vomiting due to cisplatinum: a double blind study.Med Oncol Tumor Pharmacother1986;3:39–42. .Nabilone: an alternative antiemetic for cancer chemotherapy.Arch Dis Child1986;61:502–505. .Nabilone: an effective antiemetic in patients receiving cancer chemotherapy.J Clin Pharmacol1981;21: 64–9S. .Delta-9-tetrahydrocannabinol as an antiemetic for patients receiving cancer chemotherapy. A comparison with prochlorperazine and a placebo.Ann Intern Med1979;91:825–830. .Randomized comparative trial of a new anti-emetic: nabilone, in cancer patients treated with cisplatin.Biomed Pharmacother1983;37:24–27. .Antiemetic therapy: a review of recent studies and a report of a random assignment trial comparing metoclopramide with delta-9-tetrahydrocannabinol.Cancer Treat Rep1984;68:163–172. .Superiority of nabilone over prochlorperazine as an antiemetic in patients receiving cancer chemotherapy.N Engl J Med1979;300:1295–1297. .A randomised multicentre single blind comparison of a cannabinoid anti-emetic (levonantradol) with chlorpromazine in patients receiving their first cytotoxic chemotherapy.Eur J Cancer Clin Oncol1983;19:1087–1090. .A double-blind, controlled trial of nabilone vs prochlorperazine for refractory emesis induced by cancer chemotherapy.Cancer Treat Rev1982;9:25–33. .A multi-institutional phase III study of nabilone vs placebo in chemotherapy-induced nausea and vomiting.Cancer Treat Rev1982;9:45–48. .Delta9-tetrahydrocannabinol (THC) as an antiemetic for patients receiving cancer chemotherapy; a double blind cross-over trial against placebo.Vet Hum Toxicol1979;21:228–240. .Dronabinol and prochlorperazine in combination for treatment of cancer chemotherapy-induced nausea and vomiting.J Pain Symptom Manag1991;6:352–359. .Nabilone vs placebo in the treatment of chemotherapy-induced nausea and vomiting in cancer patients.Cancer Treat Rev1982;9(suppl B):49–53. .Efficacy of tetrahydrocannabinol in patients refractory to standard antiemetic therapy.Invest New Drugs1988;6:243–246. .Comparative trial of the antiemetic effects of THC and haloperidol.J Clin Pharmacol1981;21: 38–42S. .Crossover comparison of the antiemetic efficacy of nabilone and alizapride in patients with nonseminomatous testicular cancer receiving cisplatin therapy.Klin Wochenschr1986;64:362–365. .A cross-over comparison of nabilone and prochlorperazine for emesis induced by cancer chemotherapy.Am J Clin Oncol1985;8:336–340. .Antiemetic effect of tetrahydrocannabinol. Compared with placebo and prochlorperazine in chemotherapy-associated nausea and emesis.Arch Intern Med1980;140:1431–1433. .Prospective randomized double-blind trial of nabilone versus domperidone in the treatment of cytotoxic-induced emesis.Cancer Chemother Pharmacol1986;17:285–288. .Antiemetic effect of delta-9-tetrahydrocannabinol in patients receiving cancer chemotherapy.N Engl J Med1975;293:795–797. .Antiemetics in patients receiving chemotherapy for cancer: a randomized comparison of delta-9-tetrahydrocannabinol and prochlorperazine.N Engl J Med1980;302:135–138. .Double-blind comparison of the antiemetic effects of nabilone and prochlorperazine on chemotherapy-induced emesis.Cancer Treat Rep1980;64:219–224. .Cannabis and cancer therapy: a comparison of Delta-9-THC and prochlorperazine.Cancer1982;50:636–645. .Double-blind, randomized, crossover trial of nabilone vs. placebo in cancer chemotherapy.Cancer Treat Rev1982;9(Suppl B):39–44. .Marijuana: medical implications.Am Fam Physician1999;60:2583–2593. .In search of an effective antiemetic: a nursing staff participates in marijuana research.Cancer Nursing1980;Aug:271–276. .Inhalation marijuana as an antiemetic for cancer chemotherapy.New York State J Med1988;88:525–527. .Size is everything—the impact of event rate variation on clinical trials and meta-analysis.Pain1998;78:208–216. .Quantitative systematic review of topically-applied non-steroidal anti-inflammatory drugs.BMJ1998;316:333–338.